creative savv: I'd love to have a "real" greenhouse . . . I'd love to have a "real" greenhouse . . .
. . . but for now, I work with what I've got. We still have a few more weeks of cool, overnight temperatures, here in the PNW. Too cool for plants like tomato to be out in the garden without a cover. 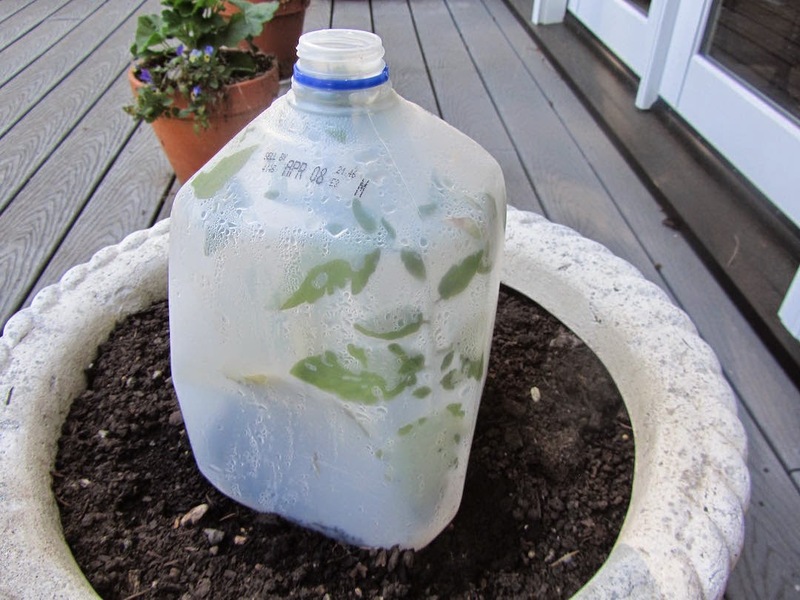 On the deck and in the garden, I use gallon milk jugs, with the bottoms cut out, over single tomato plants. 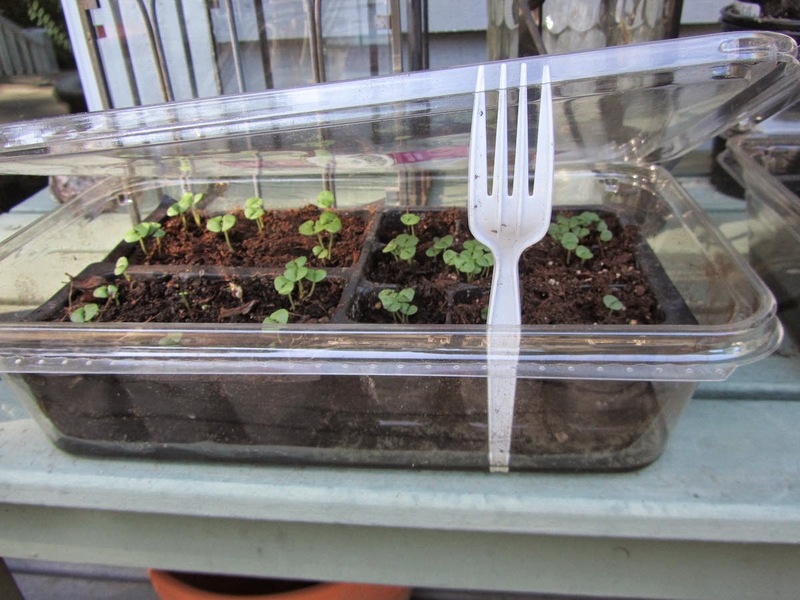 For my basil starts, I use plastic clamshells that lettuce came in this past winter. And in the garden, I use these row covers over a long stretch of small plants. I planted out my tomato seedlings on the deck, around the first of April, which is about a month earlier than is recommended for our area. They're doing well, under their covers. And I hope to be slicing into a fresh tomato in July this year, which would be about 6 weeks earlier than planting into the bare ground in the garden, around the 6th of May. In this area, no one actually plants tomato seeds into the ground when it is warm enough. We'd be hard pressed to get any fruit that way because the growing season would be too short. 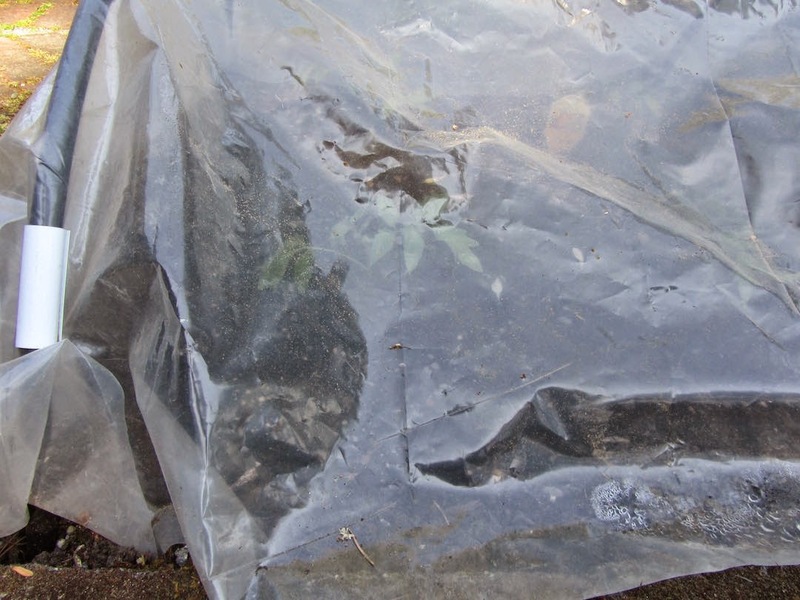 Most are started inside, but gradually make it outside under cold frames. I don't know of anyone planting out tomato seeds directly into the garden, either. I've always done seedlings, sometimes starting them indoors myself, other times buying them as small plants. Our "hot" growing season is short here, as well. Our last frost date, here, is around May 10. I've had the same experience, with plating out early, and it not working out, some years. But other years, it turns warm early and stays warm. That's great that you found row covers right in your own garage. Putting plexiglass over your old chicken run would make a great little cold frame, I'd think. Good luck with that! My hubby uses those giant pickle buckets to cover our garden goods--been using it on a cabbage that my daughter received as a school project! We typically wait till after Memorial Day to plant most things (and we don't use tomato seeds--we buy plants) except for cooler weather greens. your daughter must be so pleased with her little cabbage plant. Maybe she'll grow up to love gardening just like her daddy! I would like a very small green house box for seedlings, but we have a very long growing season. I should be planted right now, but we are doing some extensive landscape altering so I am still waiting on a delivery of cross ties. Oh, I can totally understand. This year, your seeds my be little late in getting planted, but in future years, it sounds like you will have a better set-up! Have you started seeds in flats or containers, yet? That would help your plants get started while you wait for the cross ties to be set in place. Good luck! I'm sure it will be wonderful once it's completed.